These Prize Wheel Markers Create Vibrant Messages that Really Stand Out! 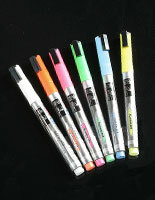 Each Pack Includes 8 Bright Color Pens. These Prize Wheel Markers Are Available for Quick Shipment from This Online Warehouse. Ink flows evenly and dries quickly for a clean message. 3/16" (6mm) chisel tip for broad and fine writing. 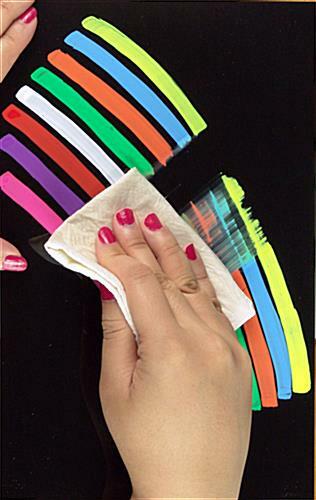 Wet-erase ink cleans easily with any damp or wet towel. 8 Bright and vibrant colors in a box for colorful artwork! 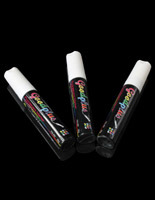 These chalk ink markers are perfect for any business looking to get their messages across. 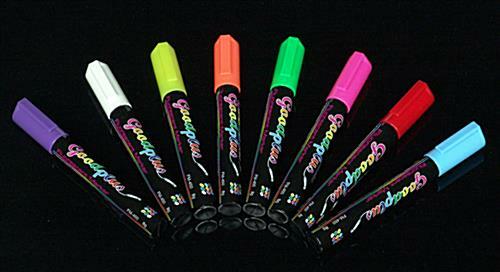 Each fluorescent pen features a bright and vibrant coloration that brings signs and messages to life. 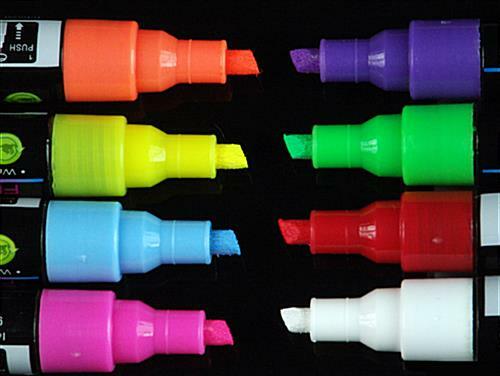 These wet-erase chalk ink markers, also known as liquid fluorescent pens, are sold in rainbow-color tones. 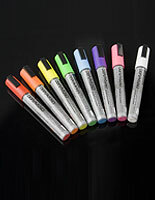 The set contains markers in 8 colors, including one each of blue, white, green, pink, purple, yellow, red and orange. Each pen has a 3/16" slanted tip which allows users to produce a wide range of strokes from tiny little details to wide color fill-in. 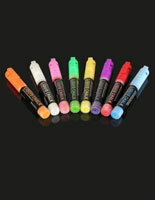 These chalk ink markers that have a chisel tip are perfect for any broad or fine writing on a flashing LED board. Create glowing messages and artwork that draw attention from passersby by using these write-on bright sticks. These chalk ink markers that have brilliant colors captivate any viewer, even from a distance! The fluorescent pen writes smoothly and dries quickly on any non-porous surfaces. 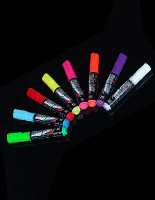 These neon bright sticks, colorful chalk ink markers are made from high concentration fluorescent powder. Messages written on the board using these wet-erase sticks also can be erased with any damp or wet cloth. Therefore, for businesses that frequently change their menu items, these chalk ink markers that clean off easily will be an ideal writing instrument. 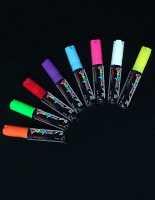 Neon bright sticks, like the one seen here, are nothing like traditional chalk which often leaves dust or ghosting. These liquid fluorescent pens, chalk ink markers can be used on windows, glass, plastic and glossy blackboards. For better results and greater effect, customers can also use these chalk ink markers on a flashing LED light box to make the message glows in the dark. 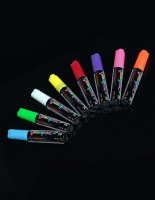 Add excitement, emphasis and color to your message board with these liquid neon pens. Businesses can create an impressive message board that gets noticed with these fluorescent bright sticks. Buy these liquid neon pens today and see the differences yourself!